Pedestrian Night at Orchard Road: Now on till Dec 2015! Woohoo! I visited Orchard Road with Jiahui, Hannah, Yueqi and a few other bloggers on the first Saturday of July for the Pedestrian Night (乌节路步行街之夜). MISSED THE JULY PEDESTRIAN NIGHT? If you missed the July one, don't worry! Pedestrian night will be held every first Saturday of every month from July to December 2015! What is the Pedestrian Night, you ask? Spearheaded by Orchard Road Business Association (ORBA) and supported by Singapore Tourism Board (STB), this initiative aims to inject street vibrancy into the precinct by creating an integrated community space with activities such as street tennis and mass yoga for all to enjoy. Posing for a photo while Hannah takes a picture of us. Talented street buskers, balloon sculptors plied the street. There was also a HAG Photo Booth for people to take photos and stand a chance to win one of the three HAG Capisco Puls chairs worth $1299 each. Me with a white designer chair, known as Chairs in Squares. Designed specially for people to relax, unwind and enjoy the outdoors. The project is part of the URA's PubliCity programme to create a more lively and active public space. The Barclays Asia Trophy on display! Took a photo with it, but not showing it here! haha. Yueqi and I taking photo with a mascot. We also saw Flame of the Forest (FOTF) preparing to perform their tunes to a huge crowd who was already patiently waiting! For more information on the 4 July Pedestrian Night, click here! You'll also find a great list of shops in participation with promotions and in-mall activities. DID YOU MISS THE 4 JULY PEDESTRIAN NIGHT? 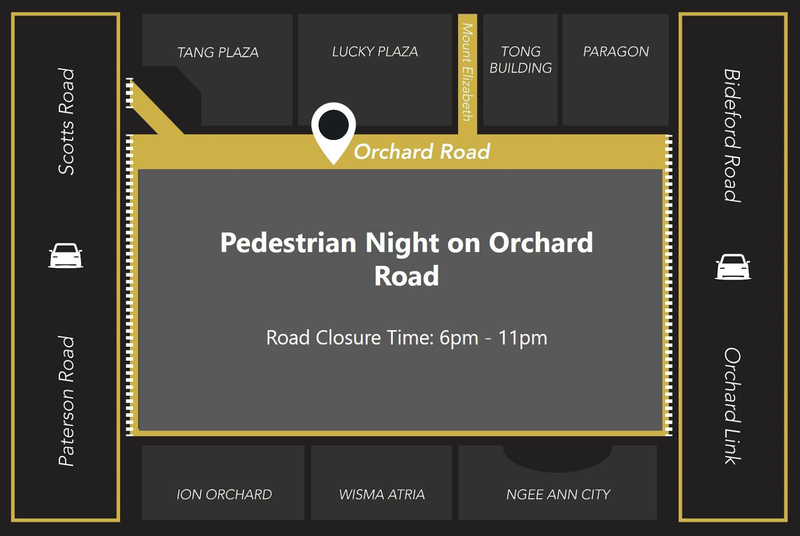 For the latest information about Pedestrian Night, please visit http://www.orchardroad.org or follow them on Facebook at www.facebook.com/orchardroad.sg and Instagram at @orchardroad.sg. Rev-Up on Orchard - Celebrating everything Fast and FURIOUS! Family Fiesta - Carnival of activities for the entire family. Fashion Night - Style yourself up and take your best shot! Christmas on a great street - Immerse yourself in the sea of bright and tinkering festive lights! *Theme and highlights are subjected to change. There is also a photo contest for instagram whereby you stand a chance to win an Instax SHARE Printer bundle worth $250 simply by posting to #PedestrianNight with the photo theme “You and Your Best Buy @ Pedestrian Night”. This post is by media invite.